A couple of months ago I returned from my first ever BA Tier Points run. For some the thought of spending a weekend hopping around Europe with only a couple of hours in each destination seems close to madness. To others the benefits of retaining a certain British Airways elite status is more than worth the sacrifice and too good an opportunity to miss. Today I’m going to be taking a detailed look at the sometimes confusing world of BA Tier Points and why they may improve your overall British Airways flight experience. What Exactly Are British Airways Tier Points? How Many Tier Points Will You Earn? Avios points (or the generic term air miles) are earned based on the distance and class of travel (as well as BA status but we’ll touch more upon this later) as well as various other non-flying alternatives including the likes of credit cards. They can then be redeemed for free flights, upgrades and other perks. Tier Points are again based on the distance and class of travel, however they also count towards BA Executive Club status. 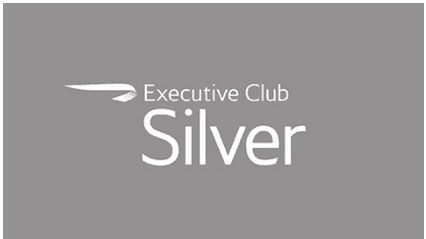 With the more BA Tier Points earned each year, individuals can work their way up through the various Tiers of elite status within the British Airways Executive Club. 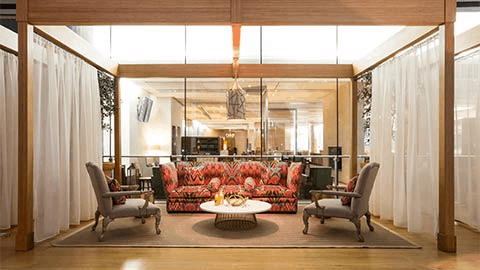 Each status elevation offers various benefits over the previous, including the likes of complimentary First-Class lounge access, additional baggage allowance, premium check-in services, etc. Unlike Avios points, British Airways Tier Points expire at the end of each membership year. So to retain a particular level of status you’ll need to earn a certain number of Tier Points each year which can be frustrating if you’re only a few short… This is where a BA Tier Point run may come in handy, however we’ll touch upon this later! As I mentioned earlier, the only way to earn British Airways Tier Points is by flying. Whilst the most likely airline you’ll earn Tier Points with is British Airways you can also earn them with various BA partner airlines. Let’s start by focusing on Tier Points earned with British Airways. BA Tier Points are calculated by both the class of flight you are travelling in as well as the distance of the flight. The easiest way to find the number of Tier Points earned from a flight is by using the BA Tier Points Calculator (found on the BA website here). 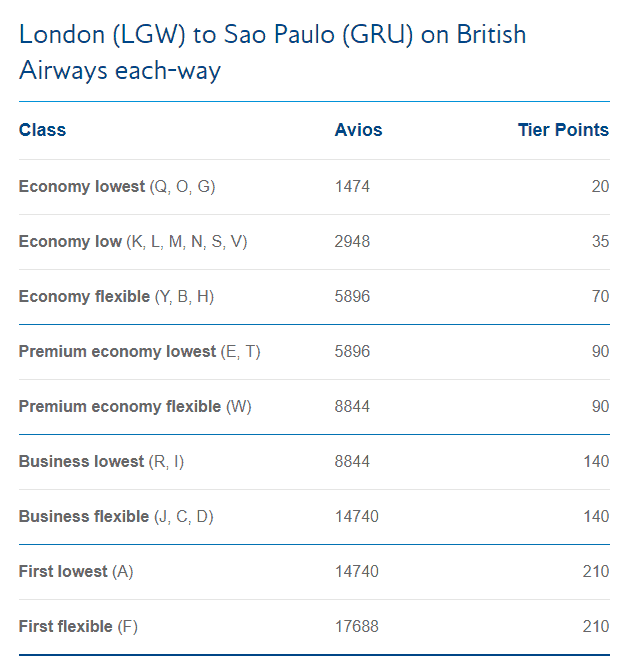 Let’s take a look at a worked example from London to Sao Paulo using the BA Tier Point Calculator. As can be seen from the above, the number of BA Tier Points earned in economy will vary depending on the type of ticket purchased. With a Business-Class flight earning 7 times the number of Tier Points compared with an economy flight (in this instance) it’s clear the Tier Point calculations favour those travelling in premium seats. Regular reader will know that as British Airways is a member of the Oneworld alliance it’s possible to earn Avios points on flights with the 12 other airlines within the partnership. What’s even more interesting is that you can also earn BA Tier Points (yes that’s right, British Airways Tier Points!) when flying with any of those 12 airlines. Earning Tier Points is easy – simply enter your British Airways Executive Club number when booking a Oneworld flight and the Tier Points will automatically be credited to your account. The following airlines are included within the Oneworld alliance, opening up the opportunity to earn Tier Points with a varied collection of partners. There are three further British Airways partner airlines which are not part of Oneworld however still allow BA Tier Points to be earned. These are Emirates, Aer Lingus and Alaska Airlines. The process of collecting BA Tier Points with these ‘partner airlines’ isn’t quite as simple as with the Oneworld partners. 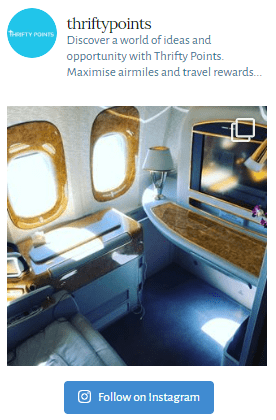 To earn Tier Points with Emirates you’ll need to book on a codeshare with Qantas. This means that whilst you would be booking through the Qantas website you’ll actually be flying on an Emirates aircraft. A slightly easier option is to book an Aer Lingus codeshare flight through the British Airways website. Unfortunately Aer Lingus and BA only have a codeshare agreement between London and Dublin so you won’t be able to access cheap Aer Lingus flights to the US. The final option, Alaska Airlines, will allow you to earn Tier Points on tickets which have been booked directly with Alaskan BUT strangely not on codeshare flights. Worth bearing in mind if you’re flying to the US with a Oneworld partner and connecting to Alaska Airlines. In this instance you wouldn’t earn BA Tier Points on the Alaskan leg as it would be a codeshare with American Airlines. 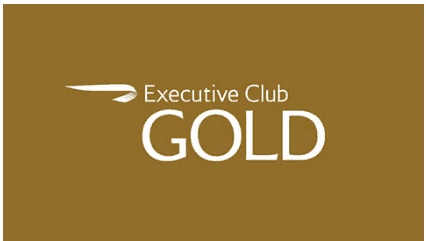 There are four main stages of British Airways Executive Club elite status – Blue (entry level), Bronze, Silver and Gold (top – well kind of as we’ll see in a bit). To progress through each of the elite statuses you’ll need to earn both a certain number of Tier Points each membership year as well as taking a certain number of ‘eligible flights’. Eligible flights are defined on the British Airways website as those which have either been marketed or operated by either BA or Iberia. 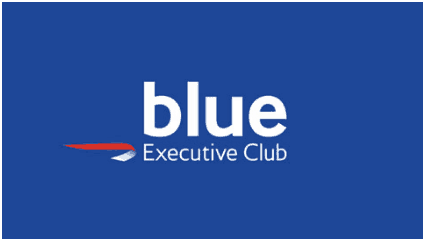 This means that you wouldn’t be able to progress past Blue by allocating numerous Sri Lankan Airlines flights to your British Airways Executive Club account unless you take two BA flights. At the end of each membership year, your British Airways Tier Points will be reset and any elite status obtained will be retained for a further 12 month. Therefore to retain status you’ll need to earn the required Tier Points on an annual basis as well as taking the mandatory number of eligible flights. 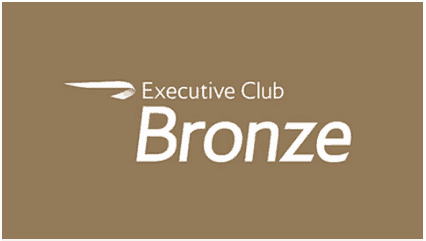 When you join the BA Executive Club you’ll receive British Airways Blue executive club status. Whilst there are no real benefits of BA Blue it allows you to collect both BA Tier Points and Avios points. 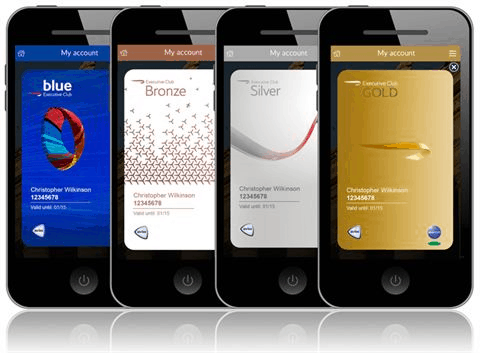 Thrifty Points’ thoughts on what the British Airways Bronze benefits are worth? Being able to use Business-Class check-in desks can definitely save time, and having the security of being able to book seats 7 days before the vast majority of people also has its benefits. However, overall I wouldn’t go to the lengths of a Tier Point run just for the sake of the BA Bronze benefits! Thrifty Points’ thoughts on what the BA Silver benefits are worth? The perks with British Airways Silver are great for those who regularly travel with British Airways in economy. I’ve never managed to pack enough to need two bags, however for long holidays with children I could see the appeal of being able to take two LARGE bags. Thrifty Points’ thoughts on what the BA Gold benefits are worth? For me the complimentary spa treatments with BA Gold have limited value, however my other half can’t get enough of them! As such the various benefits offered by the British Airways Gold elite status will vary depending on numerous factors. 5,000 BA Tier Points: The Holy Grail! At 5,000 Tier Points you’ll reach Gold Guest List. You’ll gain access to the Concorde Room (reviewed here) when flying on any BA-operated flight. You’ll also be able to unlock or force open 5 Avios redemption bookings a year at the standard rates (known as jokers) even when there is no rewards availability. Finally you can also gift 1 Gold card and 2 Silver cards to friends and family. A great side-by-side comparison of the various Tier benefits can be found on the British Airways website here. One final point worth noting is that whilst your BA Tier Points will expire at the end of each membership year they will count towards your BA lifetime Tier Points. These continue to accumulate each year and if (or once) you manage to earn a total of 35,000 Tier Points you’ll receive British Airways Gold status for life. For those who travel even more, once you reach 100,000 Tier Points you’ll be rewarded with Gold Guest List for life (although by this point I suspect for some they’d never want to set foot on a plane again!). Where can I find the BA Tier Point Calculator? Just head straight to the British Airways website and the BA Tier Point calculator has its own dedicated page – found here. Can BA Tier Points be transferred? I’m afraid to say that unlike Avios, British Airways Tier Points can’t be transferred between BA Executive Club members. When do Tier Points expire? Your tier points will expire at the end of each year. I’ve rambled on long enough that I won’t even begin writing about the weird and wonderful world of both Tier Point runs and breaking up flights to increase the number of Tier Points earned. A full article on BA Tier Point runs will be following shortly so do keep an eye out!